Ballymena United manager Glenn Ferguson. Picture: Pacemaker Press. Glenn Ferguson insists he is only looking at the teams above Ballymena United in the closing weeks of the Danske Bank Premiership campaign. 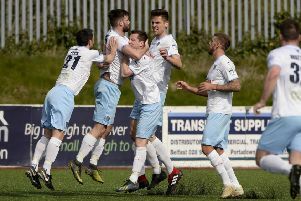 Saturday’s win at Ballinamallard took the Sky Blues 11 points clear of the relegation play-off place ahead of the final five post-’split’ fixtures. The first of those comes on Saturday when United travel to ‘derby’ rivals Coleraine (3pm), knowing that victory will take them to within a point of the seventh-placed Bannsiders. “I wasn’t even looking down to be honest because it is difficult for teams who are down there to win three or four games out of five to catch us when they haven’t done it all season,” said Ferguson. “I said to the boys at Ballinamallard about picking up three points and try and get closer to Coleraine. For Ballymena fans over, if you finish above Coleraine it gives you a bit of bragging rights. “Saturday showed we can do it in difficult places and that is something we can take into our last five games. “We want to try to get three points closer to Coleraine first of all. “But we want to try and win them all - if we do it will put us over the 50 point mark and I think we have only managed that once before,” added Ferguson, who has already begun trimming his squad with next season in mind by releasing Brian McCaul and Gary McCutcheon from the remainder of their contracts. Midfielder McCaul, who endured an injury-affected season at the Showgrounds, is understood to be planning to travel to the USA, while McCutcheon, who returned to the club for a second spell in January, had already stated his intention to retire at the end of the season, to focus on a new career opportunity. * Seven Towers Supporters’ Club transport for Saturday’s game leaves Henry Street car park at 2pm.